The other day while I was shopping, I saw the September issue of Martha Stewart Living Magazine. On the cover is a beautiful photo of Martha’s new kitchen. I gave in, bought the magazine and lusted over Martha’s: marble countertops, pots, knives, convection oven, stainless steel appliances and tableware. I then flipped through the magazine to see if there were any recipes I wanted to try. I found two chocolate recipes. The first was a chocolate ginger brownie, which is one of those mix everything in one-bowl recipes and the second was a simple chocolate pudding. The memories I associate with both these desserts are of childhood – when things were simple and carefree. So I dedicate these desserts to the child in all of us. When making chocolate desserts, I usually go by the following guideline: use good chocolate! The types of chocolate that I prefer to use are Valrhona, Scharfenberg, Callebaut or Lindt. The quality of your chocolate will affect the quality of your desserts and baked goods - try not to compromise. For the brownies I used a dark bittersweet Callebaut and for the pudding, I used a dark semisweet Callebaut. The ginger in the brownies was a nice touch, it gave the brownies a rich and complex flavour, that was familiar and comforting, without being too sweet or intense. The chocolate pudding was tasty, simple and satisfying. The flavour and consistency is exactly what a chocolate pudding should be. Both recipes are incredibly simple and comforting. 1. Preheat oven to 325ºF. Butter an 8” square baking dish. Line bottom with parchment paper, allowing 2 inches to hang over 2 sides. Butter parchment; set aside. Melt butter and chocolate together in a medium saucepan over medium-low heat, stirring until smooth. Remove from heat, and stir in remaining ingredients. 2. Pour batter into prepared dish. Smooth top with a rubber spatula. Bake until a cake tester inserted into the centre comes out with moist crumbs, 30- 35 minutes. Let cool in pan on a wire rack. Cut into squares. Brownies can be stored in an air tight container at room temperature up to 4 days. 1. Whisk granulated sugar, cornstarch, cocoa, and salt in a medium pan. Whisk in milk and yolks. Cook over medium-low heat, whisking, until thickened, 8-10 minutes. Remove from heat. Add chocolate and butter; whisk until melted. 2. Pour pudding through a sieve into a heatproof bowl and set in an ice-water bath. To prevent a skin from forming, press plastic wrap directly onto the surface. Refrigerate, stirring occasionally, until cold and set, about 40 minutes (up to 2 days). 3. Whip cream and confectioner’s sugar in a medium bowl until soft peaks form. Divide cold pudding among 4 bowls, and serve with whipped cream. Posted by Sam at 12:21 a.m. Both recipes look so delicious. When I was pregnant I craved chocolate pudding in the worst way. My cravings were often things I had as a child. When I was young I used to cuddle up on the couch with a bowl of chocolate pudding and watch The Cosby Show. Only fitting as Bill Cosby was the Pudding Pop spokesperson. Anyway, thanks for sharing those recipes and your quenelle is beautiful. I want chocolate from the moment I get up til I go to bed...I am sure these 2 recipes are in my near future. I always admire your recipes and your talent. I so want her kitchen too! Both of those look scrumptous. I agree, when making chocolate desserts you can't take shortcuts only the best will do. 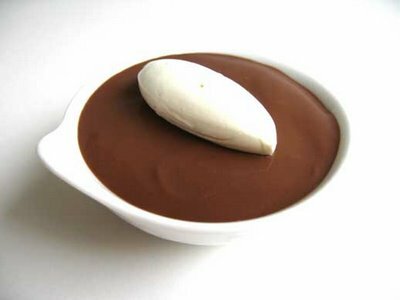 Your Chocolate pudding looks so heavenly. What a perfect dish! YUM. I love both ginger and chocolate but have never tried them together. The brownies sure look deliciou. Thanks for sharing the recipe! Thanks for visiting and for your comments. It is funny that most of us are probably nostalgic for Jello-pudding, I remember it was good, but this chocolate pudding is infinately better. Spoken like a true chocoholic! I also see them in your near future as well. I'm sure that if we win the lotto that we could afford her designer, carpenter, cabinet maker and all those wonderful appliances and peices of tableware. I'm going out to buy a lotto ticket today! Chocolate shortcuts usually lead to chocolate disappointment. Thanks for agreeing with me Jenjen. Thanks for visiting and for your lovely comment. The chocolate ginger brownies were really good, I definitely recommend trying them. I haven't had chocolate pudding in ages, I think I have to make some now! 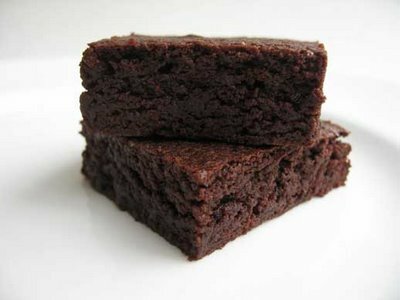 Those brownies are pretty tempting too, I love ginger. Your Awesome, Thanks! I have seen your blog, all your dishes look great. Thanks for visiting. I hadn't made pudding for a long time as well. That's why I was inspired to make it when I saw it Living Magazine. Thanks for visiting. Chocolate is one of the best things on earth. Thanks for your lovely comments Anita. Once you have had good chocolate, you can't really go back. Cheers!